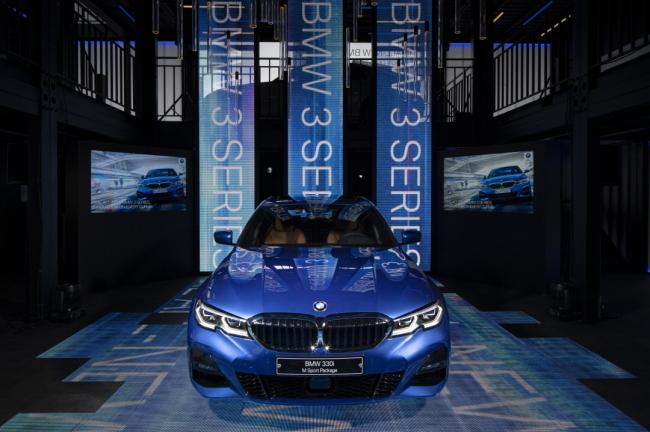 BMW has unveiled the seventh generation of its best-selling 3 Series sports sedan, the automaker said Thursday. The premium sports sedan series has been the most popular since it was launched in 1975. In the past four decades, at least 15 million units have been sold globally. “The new 3 Series applied BMW’s unique design langauge based on the key concept of ‘precision and poetry.’ We tried to emphasize modern and concise design based on the exterior’s character line,” said a BMW designer Kim Nury. Exterior of the new 3 Series features aggressive-looking active airstream front grille, along with full LED headlights. L-shape LED rear lamps and a large exhaust pipe create a dynamic, wider look, BMW said. For interior, BMW has put a 12.3-inch dashboard screen and 10.25-inch center display next to each other. The new 3 Series is 76mm longer (4,709mm), 16mm wider (1,827mm) and 6mm taller (1,435mm) than its predecessor for improved rear seat comfort. The wheelbase is also longer by 41mm (2,851mm). Th upgraded engine is available in the Korean market in two different lines: the New 320d and new 330i. Both are tuned to deliver maximum torque of 40.8 kilogram-meters, while the former runs on 190 horsepower and the latter on 258 horsepower. All new 3 Series models use double-glazed windows for the front wind screen to reduce the road noise transferring into the cabin. For new 330i luxury model, double-glazed windows are installed on the left and right side windows in the front seat. The new 3 Series is equipped with a parking assistant, which features a reversing assist system, which semi-autonomously reverses the car at low speed through narrow corners, by recording the car’s route every 50 meters. The price range begins from 53.2 million won ($46,697) for the standard 320d model and goes up to 65.1 million won.